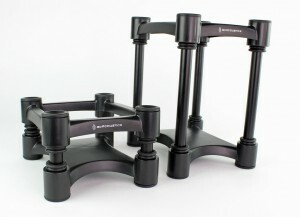 IsoAcoustics ISO-L8R155 Speaker Stand, sold in pairs. Make not mistake, this is probably the best investment for sound improvements; that’s why if you googled it, many will swear by that these are the best speaker stands in the world. The ISO-L8R155 isolation stands are designed for medium size speakers and studio monitors. A practical and effective solution for desktop, bookshelf and floor standing speakers. The IsoAcoustics patented isolation system provides superior isolation and decoupling from the supporting surface. The stands are a complete kit to optimize your speaker placement and performance by assembling them in the short or tall configuration and setting the desired upward or downward tilt. The ISO-L8R155 stands have an overall size of 6.1”x7.5” (155x190mm) and can be configured to an overall height of 3.7” or 8.75” (9.5mm or 22.5mm) with inserts that provide up to 6.5 degrees of tilt upwards or downward. Altogether, up to 14 variations of height and tilt adjustment are available to optimize speaker placement. 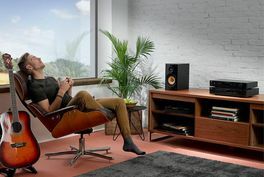 It is suitable for most bookshelf speakers with 5″ to 7″ subwoofers. If you are not sure if IsoAcoustics ISO-L8R155 is suitable for your speakers, please kindly use this link below to check. Introduction to IsoAcoustics Speaker Stand – The best stands in the world?